Holiday preparations, with all the “extra” that they require of us as wives, mothers, and homemakers, threaten to send us over the edge from Christmas stress. We want to make everything merry and bright, but sometimes the pressure of outside expectations and (let’s be honest) our own inner expectations can turn us into the Grinch. Spend some time thinking about what your plans are for the season and decide if they are reasonable. Be aware of any fantasies of perfection you may be indulging in as you plan. Stop that right now! 2. You can skip some stuff. You do not have to do all the things just because you always do all the things. Consider if perhaps there are some items on your to-do list that no longer belong there. Maybe you can free yourself up by letting go of something that no longer works for you and your family. Shopping? Baking? Wrapping? Cleaning? We drive ourselves nuts when we try to do it all in the last few days before Christmas. Think now about what some of your biggest projects are and look for ways to get them done (or at least started) ahead of time. Schedule it now! 4. Make room for Jesus. Look for a way to add a new prayer practice to your Advent season. Do you know Advent is meant to be a mini Lent? Many of us do not think of it that way, but it is liturgically correct to consider taking on some small penance or prayer during the season of Advent. Leave some room in your calendar for quiet connection with God. 5. Realize that Christmas is a season. Didn’t get around to that special craft project or baking those fancy cookies before December 25? No problem! You have 12 days of Christmas to celebrate! I also share a response to listener Alyssa who asked for my number one piece of marriage advice for young couples. Maybe you have a perfect memory from your childhood. That moment didn’t happen because your mother or father perfectly orchestrated it. It is all grace and that grace exists inside your own home and family now. I also announce my newest retreat, You Are Enough, based on the themes in my newest book. Get all the information here! 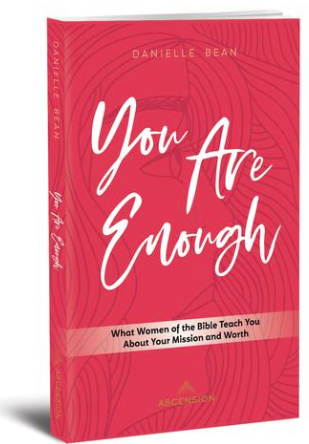 You Are Enough: What Women of the Bible Teach You About Your Mission and Worth, is available for order! Use the code, GIRLFRIENDS to receive ten percent off your order. Don’t miss out on this special available exclusively to listeners of the Girlfriends podcast. I can’t wait to share this book with you!